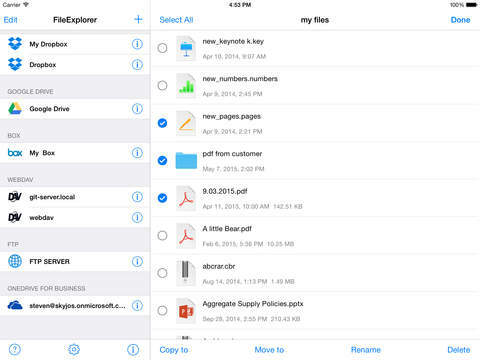 FileExplorer helps you to access files on your computer (Mac OS X, Windows, Linux), NAS and Cloud Storage (Dropbox, Google Drive, OneDrive etc) from iPhone/iPad. Stream movies and musics to your iPhone/iPad. Directly view photos, play slideshow without iTunes sync. Access and manage documents on your office computer from home through iOS VPN or port forward. Supported OS and device: Windows, Mac OS X, Linux, Time Capsule and NAS. Access network shares on above OS and device by CIFS, SMB, WebDAV and FTP protocol. Manage(copy/move/rename/delete) your remote files on iPhone/iPad. Stream movies and musics from computer/NAS to iPhone/iPad. Transfer files between computer/NAS and iPhone/iPad. Built-in FTP Server: Transfer files between computer and iPhone/iPad over WiFi. Sort files and folders by name, date and size etc. File Management: Copy, Delete, Move files. 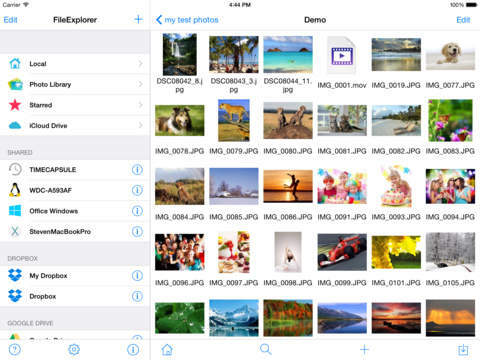 * Transfer photos between iOS photo library and computers/cloud storage. * Password lock down app. * Favorites, Email, Air Print etc. * Removed music and video downloading capability from FTP server. * Fixed a SMB connection issue with OS X 10.11.5.